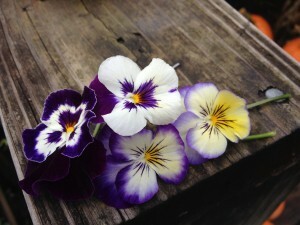 Fall is planting time here in Birmingham, and pansies and violas are the stars of the show. Even if folks plant nothing else, it’s so easy to put a few of these spring beauties in a little spot in the garden, a pot, or a window box for the winter. Oh but what a dizzying selection greets you at the garden shop! Tables upon tables of blooms…some diminutive, others large, some with solid colors, others with charming “faces”, all waiting for you to decide which of them to choose to add beauty to your landscape next spring – and even some color through the winter. 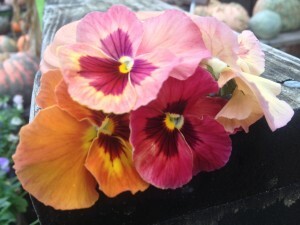 One rainy Saturday morning I put together a few sample combinations of pansies, violas, and mixtures of the two to show you a few options available for your planting pleasure…but keep in mind this is just the tip of the iceburg when it comes to playing with color in your garden! Remember to think about what else will be blooming in your garden come spring. You may not want a pink pansy in front of your orange azaleas (Though I’ve been known to favor pink and orange in certain instances! ), so think it through before you decide. Another consideration to keep in mind is the color of your house. My first summer in our home I decided I wanted an “English Garden” look out front, using pinks/purples and silvers. I was so caught up in my vision that I forgot this color palette would look like blech in front of the brick – I was unhappy with it all summer and couldn’t wait to tear it all out come fall. Now I use brighter colors and include poppies – it looks so much better! I save the more muted colors for the back of my house where I play with my “English Garden” and plant everything I want to – including foxglove and snapdragons for spring interspersed with pansies and violas. The difference between a pansy and a viola is primarily size and shade tolerance. 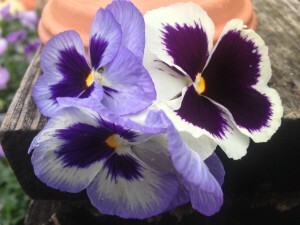 The pansy bloom and plant is larger. Pansies need at least half a day of sun to bloom well; full sun all day is best, but remember, in the spring as the temperatures rise, they’ll play out faster in so much sun. 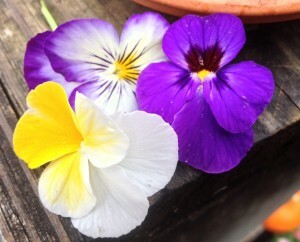 Violas are smaller in size and the blooms are smaller as well. 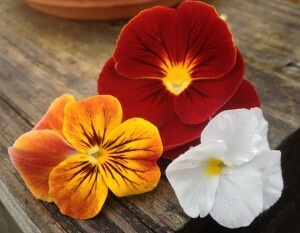 However, violas put out massive amounts of small blooms and the plants attain a nice rounded size which makes up for those diminutive flowers. 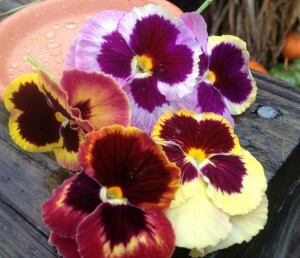 Violas can tolerate less sun, though, as with the pansies, at least half a day sun is best. As for most plants, fertilizing is important. Plant Tone is a good natural (and stinky!) amendment to add to beds in the fall. Incorporate it with a first feeding of Osmocote, which will release its nutrients until the soil gets cold. Mid-winter apply calcium nitrate to add extra nitrogen. After planting, always water your plants in and apply a good layer of mulch to keep roots warm through cold spells.While plants are blooming be sure to deadhead, (pinch off faded blooms) to keep more buds coming. If you leave old blooms on to die then set seed, this creates a messy looking plant that’s putting all its energy into that seed, not into future blooms. This is especially important to remember come spring. Don’t be overly concerned if plants aren’t blooming in the middle of winter. This is normal – especially if we have cool, frosty nights. Remember, the real reward comes in the spring! Be mindful of winter temperatures – this is the time to watch the weather reports each morning or evening. 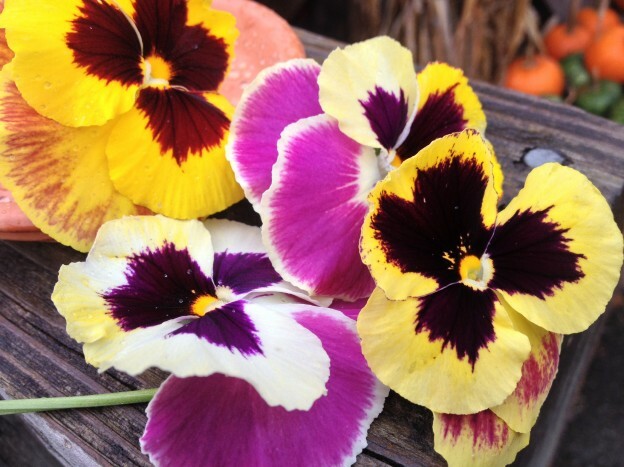 Pansies are tough plants, but help them out by making sure soil in beds or planters is moist if there are freezing temperatures forecast. Hopefully these suggestions and tips will be helpful for any of you that get overwhelmed by the choices available…happy planting! 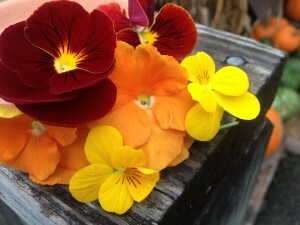 This entry was posted in Annuals, Bedding Plants, Container, Fall, Flowers, Planting Tips, Spring, Winter and tagged cool season annuals, fall planting, pansies, pansy viola combinations, violas on October 16, 2014 by Kris Blevons.